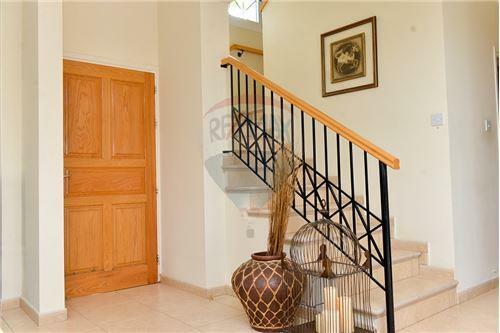 This stylish villa is located in a quiet area with easy access to the resorts amenities and within a few minutes walk from Serena Bay and Golden Coast Harbor. 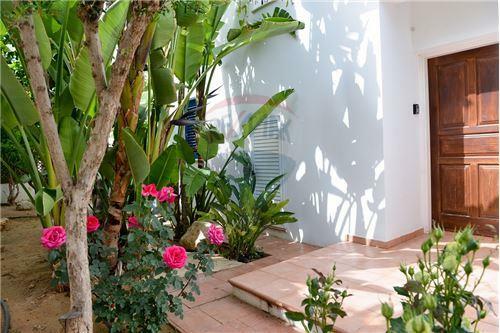 This villa is developed in 3 levels of 159.95m² total covered area plus the basement. 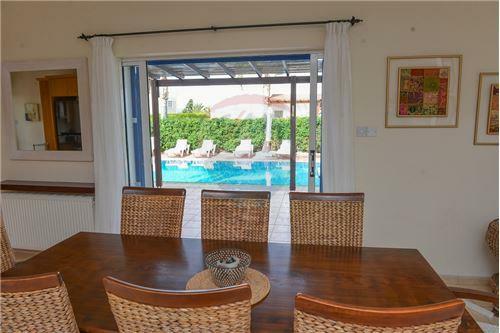 The spacious ground floor consists of an open plan living, dining and kitchen area. Comfortable sofas are arranged around the fireplace and the dining area features an elegant dining table with 8 high-backed chairs. The well equipped kitchen is fitted with stainless steel appliances and granite work top. The first of the five bedrooms is found on the ground floor, with two single beds and adjacent shower room. Three more bedrooms are located on the first floor, the master double bedroom and two further twin bedrooms. The master bedroom has its own en-suite shower room whilst the twin bedrooms have access to the full family bathroom found on this level. Both the master double bedroom and one of the twin bedrooms have access to the large pool facing balcony with views of the Golden Coast fishing shelter. The final bedroom is located on the lower ground floor level and is accessed via an external staircase which leads down from the pool level. 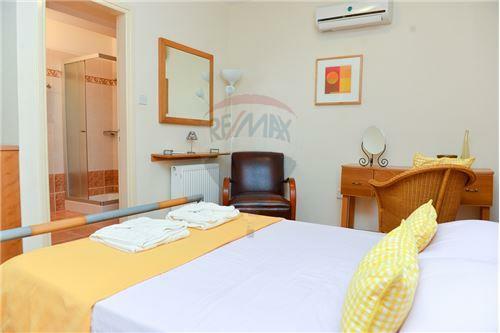 This is a double-bedded room with en-suite shower room. 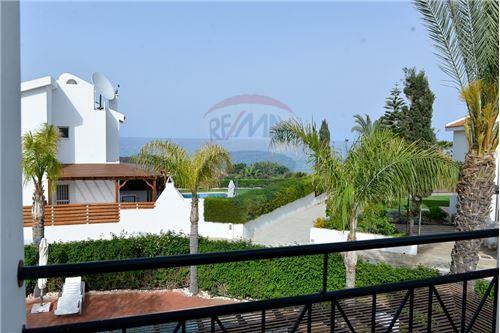 As this bedroom is self-contained and separate from the main house it is suitable for teenage children as it offers them a feeling of independence whilst still being within the grounds of the villa. 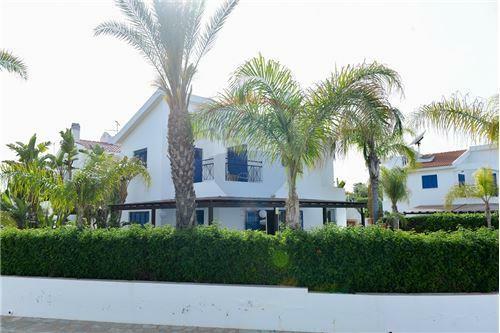 All five bedrooms are equipped with air conditioning units (for both cooling and heating) and central heating system for all year-round comfort. 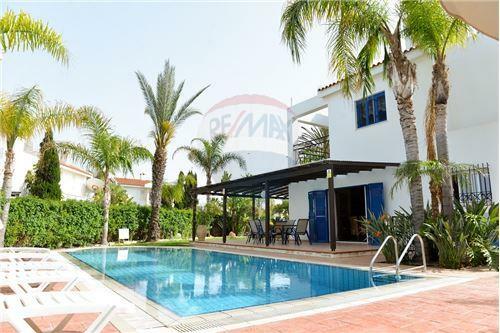 Outside the large 9m x 4m private pool with walk-in steps is surrounded by an ample sunbathing terrace furnished with sunbeds, umbrellas and a poolside shower. The swimming pool can also be heated during the winter months allowing the property to be enjoyed in comfort all year round. A BBQ provides a great opportunity for summer dining under the wooden pergola. Perimeter fencing, hedging and tall carob trees ensure the pool area enjoys a good degree of privacy. The villa is approximately 2 minutes walk (via a pathway) to the harbor and 5 minutes to Serena or Golden Coast Sandy Beach. 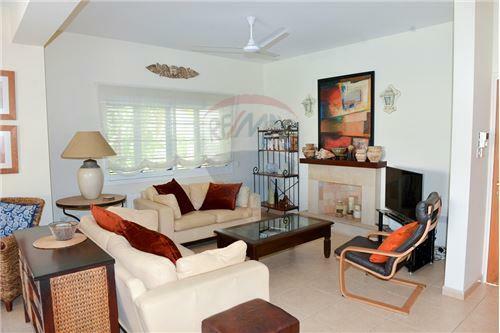 This stylish villa is located in a quiet area with easy access to the resorts amenities and within a few minutes walk from Serena Bay and Golden Coast Harbor. 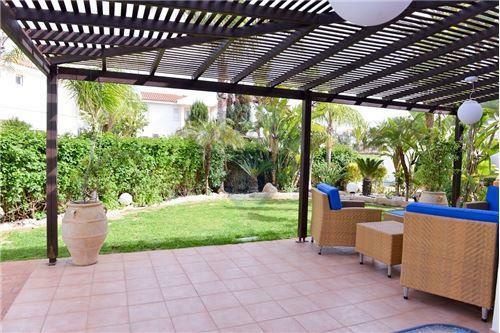 This villa is developed in 3 levels of 159.95m² total covered area plus the basement. The spacious ground floor consists of an open plan living, dining and kitchen area. Comfortable sofas are arranged around the fireplace and the dining area features an elegant dining table with 8 high-backed chairs. 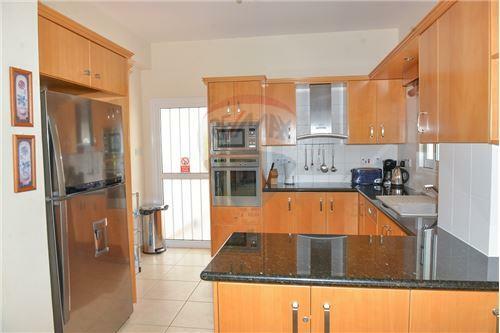 The well equipped kitchen is fitted with stainless steel appliances and granite work top. The first of the five bedrooms is found on the ground floor, with two single beds and adjacent shower room. Three more bedrooms are located on the first floor, the master double bedroom and two further twin bedrooms. The master bedroom has its own en-suite shower room whilst the twin bedrooms have access to the full family bathroom found on this level. 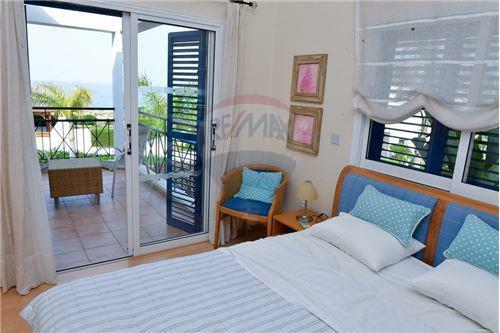 Both the master double bedroom and one of the twin bedrooms have access to the large pool facing balcony with views of the Golden Coast fishing shelter. The final bedroom is located on the lower ground floor level and is accessed via an external staircase which leads down from the pool level. 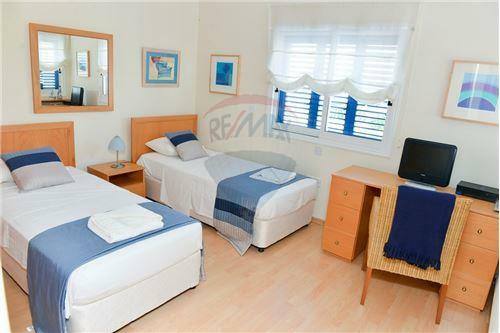 This is a double-bedded room with en-suite shower room. 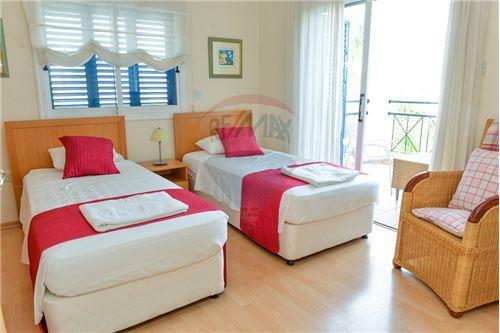 As this bedroom is self-contained and separate from the main house it is suitable for teenage children as it offers them a feeling of independence whilst still being within the grounds of the villa. 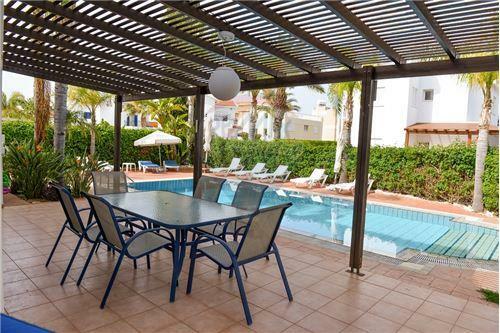 All five bedrooms are equipped with air conditioning units (for both cooling and heating) and central heating system for all year-round comfort. 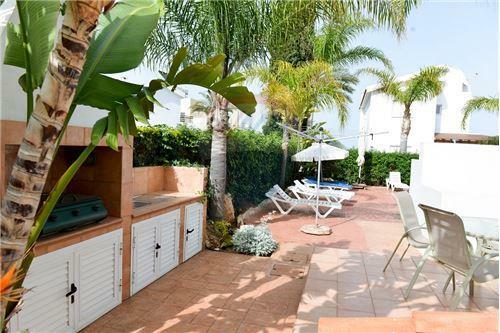 Outside the large 9m x 4m private pool with walk-in steps is surrounded by an ample sunbathing terrace furnished with sunbeds, umbrellas and a poolside shower. The swimming pool can also be heated during the winter months allowing the property to be enjoyed in comfort all year round. A BBQ provides a great opportunity for summer dining under the wooden pergola. Perimeter fencing, hedging and tall carob trees ensure the pool area enjoys a good degree of privacy. 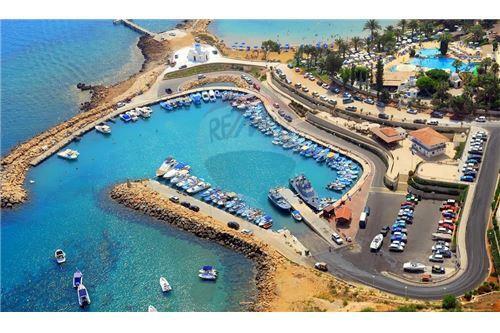 The villa is approximately 2 minutes walk (via a pathway) to the harbor and 5 minutes to Serena or Golden Coast Sandy Beach.